Dr. Beverly Moylan, a pediatric physical medicine and rehabilitation physician in the concussion centre at Holland Bloorview Kids Rehabilitation Hospital provides tips on how families and players can better understand and manage concussion recovery. How would you explain your role at Holland Bloorview? As a physician, I participate in the clinical aspects of Holland Bloorview’s concussion centre baseline testing and early care program. If a child has sustained a concussion they are first seen by me for an assessment where I can confirm the diagnosis based on history and symptoms, and rule out any neurological red flags with a physical examination. I educate families on what I’m doing, why it’s necessary, and how it’s helpful. Why do you enjoy working at the concussion centre? As a former athlete I enjoy maintaining an element of sports medicine in my practice, and I love supporting youth and athletes with returning to the activities they love. 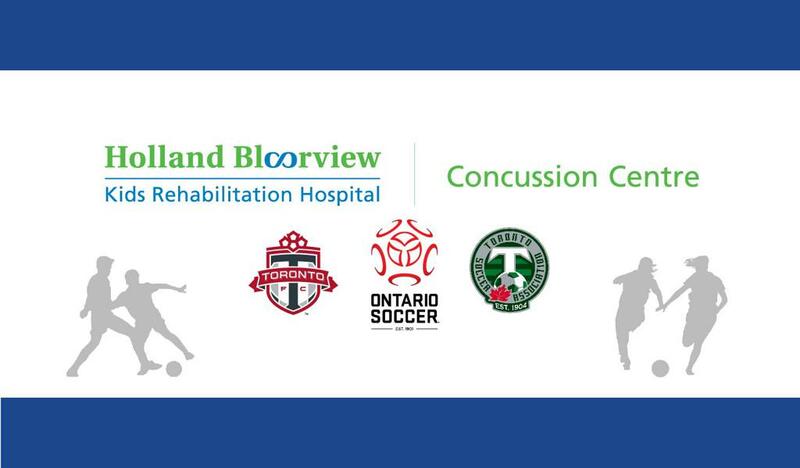 As a physiatrist, I strongly relate to Holland Bloorview’s multidisciplinary and holistic approach to concussion care. The team strives for family centered care rather than solely focusing on the brain injury. How does your experience as an athlete impact your interactions with those you see in your practice? I have been the athlete at the doctor’s office waiting to get back into the game, so I know what it’s like to be on the other side. I understand that sport can be a large part of a kid’s identity. I see that often in the patients I treat, as children’s sports often require a large time commitment. There is also an important social aspect to the sport. Although our primary goal is getting youth back to school, I’m very aware of the role sport plays in a child’s life and how important it is to include that in their recovery. I empathize with these kids, and work with them and their families to help them return to the activities they love, safely. What’s one of the biggest challenges you face with families regarding concussion and recovery? A mild traumatic brain injury is an invisible injury, so it can be difficult for parents and coaches working with the child to understand the issues that the child is now facing post-concussion. It’s difficult to understand things you can’t see, and there’s often outside pressure to participate in sport too early. What do you think are the most important parts of your practice at Holland Bloorview in the early stages of concussion recovery? I feel the nature of this program can support families in preventing persistent concussion symptoms and improving recovery progress. Accurate information and guidance early on can help families avoid unintentional mistakes throughout the process. Without the right information, it is hard for parents and youth to know what to avoid immediately after a concussion. This program provides tools for concussion management. For example, explaining what resting (physically and mentally) in the earliest stages of recovery means. Just because you’re staying home from school doesn’t mean you’re resting – screen time, reading a novel, sitting on the bench in a noisy arena continues to stimulate your brain. By providing evidence-based education and advice early on, I believe we are seeing better results in the long-term for these kids. What do you consider when clearing kids to play? We look at several factors to determine if a child is ready to return. Has the child progressed through the stages of returning to physical activity without return or worsening of symptoms? Without challenging your brain with lower intensity physical activity successfully, I am unable to determine if your brain is recovered enough to participate in full contact activity sports safely. Another question is: Has the child returned to full school participation? It’s critical to hear what the child has done during recovery and how it has impacted their symptoms. I need to know if there are areas where they are still struggling or symptoms that are impacting their function. If they struggled with something, like balance, on initial assessment, I will repeat this testing to look for objective improvement. Why is it critical to be cleared by a physician before playing returning to sport? A repeat injury to your brain during recovery puts you at a higher risk of a having a more significant injury or prolonged recovery. My job as a physician is to determine if you have recovered from a concussion before you return to contact sport. This is a critical component of concussion management. What’s one message you wish you could tell families about supporting kids through concussion recovery? My goal is to help kids get back to school and sports successfully – not keep them out of sport. This is always the driving force behind my recommendations. Unfortunately sometimes this takes longer than kids and families would like. It’s important for families to know that short-term pain will lead to long-term gain. Let’s focus on getting you back to sport the safe way – not the quick way. Families should consider these questions before seeing a doctor: Was there loss of consciousness? Difficulty with orientation? Memory loss? Help your child explain how they’re feeling. Be aware of red flag symptoms – like loss of consciousness, repeated vomiting, slurred speech – that should bring them back to the emergency room. Know what to avoid in the first week after a concussion. Cognitive and physical rest is important initially, with a gradual increase in activity. Monitor your child’s behaviour. It can be difficult for children to identify symptoms, but parents can recognize when kids are behaving differently (ie. fatigued, irritable, sad). Keep a symptom diary and take it with you to your appointments.